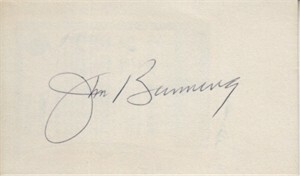 3x5 index card autographed in blue ballpoint by the late Baseball Hall of Fame pitcher (later U.S. Senator) Jim Bunning. NOTE: there is a Bunning baseball card mounted on the back. With certificate of authenticity from AutographsForSale.com. ONLY ONE AVAILABLE FOR SALE.